Israel Folau has requested a code of conduct hearing after he was issued with a breach notice by Rugby Australia (RA) over his homophobic social media posts. The union's integrity unit ruled Folau had committed a "high-level breach of the Professional Players' Code of Conduct", warranting the termination of his employment contract, and he was given 48 hours to accept the breach of contract or refer it to a hearing. The 30-year-old devout Christian said on his Instagram account last week that "hell awaits" for "drunks, homosexuals, adulterers, liars, fornicators, thieves, atheists, idolaters". 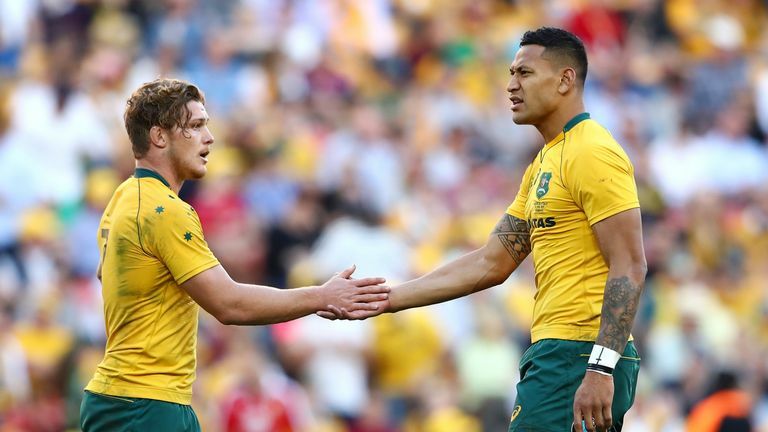 Australia head coach Michael Cheika and captain Michael Cooper give their view on plans to terminate Israel Folau’s contract. Chief executive Raelene Castle said: "Israel has responded formally today to request a code of conduct hearing which, under the circumstances, was not an unexpected outcome. We will now work to confirm a date for the hearing as soon as possible. "After the date for the hearing is confirmed, Rugby Australia and the NSW Rugby Union will make no further comment on the matter until the code of conduct process has concluded." Saracens and England No 8 Billy Vunipola was drawn into the issue when he "liked" Folau's post and then made a statement of his own backing his rival. The Rugby Football Union (RFU) have formally warned Vunipola and reminded him of his responsibilities as an England player.